It’s spring time in Texas, which means the blue bonnets are blooming and we’re peeling off our jackets to enjoy the sunshine. The changing of the seasons got us thinking about how our container-based office kept us warm this winter and will keep us cool when the balmy Texas summer arrives. Climate control in shipping container-based structures comes down to picking the right features, so we’re sharing a few insights about creating a comfortable container structure for all seasons in this two-part climate control series. 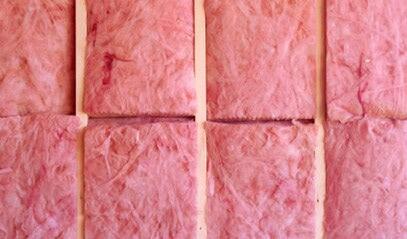 This week we’re covering the importance of insulation. Air conditioning and heating consume a serious amount of energy. For instance, a 2009 survey by the U.S. Energy Information Administration, found that climate control systems account for 40% of Texans’ power bills. When proper insulation seals in the hot or cold, AC and heating systems don’t have to run as often, reducing power consumption and your utility bill. The amount of insulation your structure requires depends on the climate of your jobsite and the modified container’s function. While sturdy and durable, the containers’ steel walls get hot in the summer and cold in the winter. You’ll definitely need insulation if you will either be living or working in the container or plan to store temperature-sensitive assets. Falcon Structures uses three basic options for insulating structures: Styrofoam, rolled batt, and spray foam. Each option has an R-value which measures its efficacy as an insulator (the higher the R-value the greater the insulation). R-values are also additive. The same way that a thermos with thicker walls does a better job keeping beverages hot or cold, thicker layers of insulation will have higher R-values. Styrofoam doesn’t just keep beverages cold at the beach; we often line modified storage containers with Styrofoam to provide basic insulation for file rooms, animal feed, and more. Standard climate-controlled storage containers come with one-inch of Styrofoam insulation (R = 4). Fast and easy to install, Styrofoam is a cost-effective way to add basic insulation to a storage container. Batt insulation, the pink cotton candy-like material you’ve likely seen in attics and crawl spaces, is the industry standard for residential and office structures. Customers usually opt to use batt insulation for offices and living spaces. Once the shipping container’s interior framing is in place, batt insulation is easy to install and conceal behind a plywood finish-out. We usually use R 13 or R 19 batt to create comfortable living and working environments. 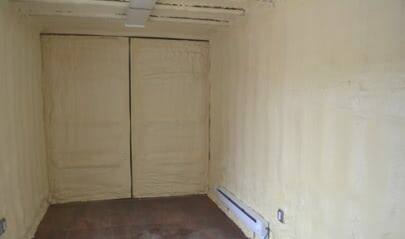 Spray foam insulation sets as a hard, water-resistant covering. While not aesthetically pleasing on its own, spray foam requires no framing and has a high R-value (R = 6 per inch of thickness). Although we offer interior finishes to cover spray foam like plywood or aluminum walls, customers seeking a purely functional climate-controlled space for temperature sensitive equipment will sometimes choose spray foam with no further finish-out. Spray foam has many benefits, but the specialty equipment required for installation also makes it the most expensive option. Our customers usually choose spray foam when they’re creating an enclosure for temperature sensitive equipment, like servers. 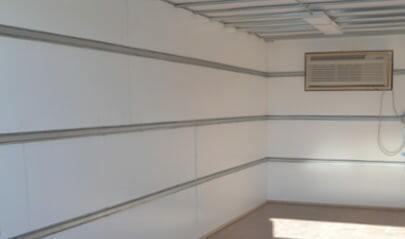 We hope this helps you understand your shipping container insulation options. Stay tuned for part two of our climate control series: AC, Heating, and Ventilation in Shipping Container Structures. Thinking about a shipping container project? Call us at 877-704-0177 or email sales@falconstructures.com.